Both of our boys are huge Star Wars fans, and they get that from me. I have always loved Star Wars, from the movies, to games, to lego, and the entire Star Wars Universe. 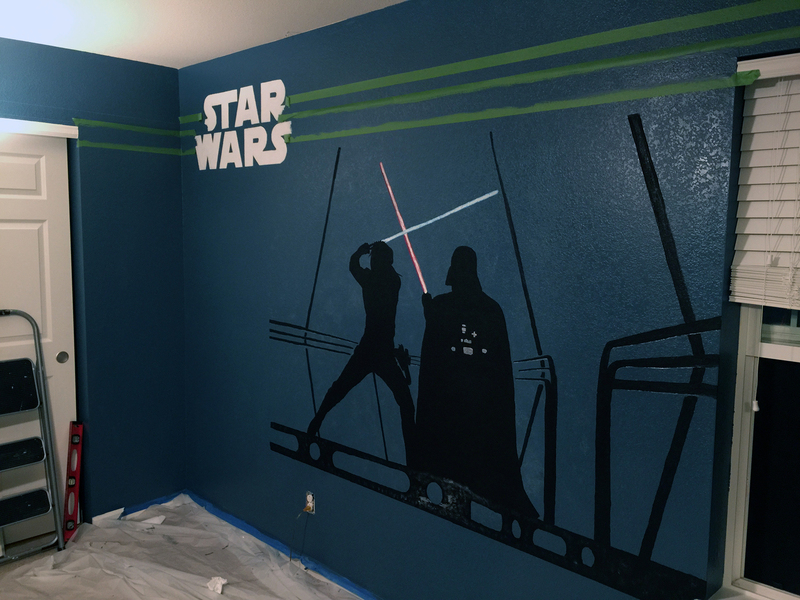 So when our son said he wanted a Star Wars themed room, we were pretty excited! 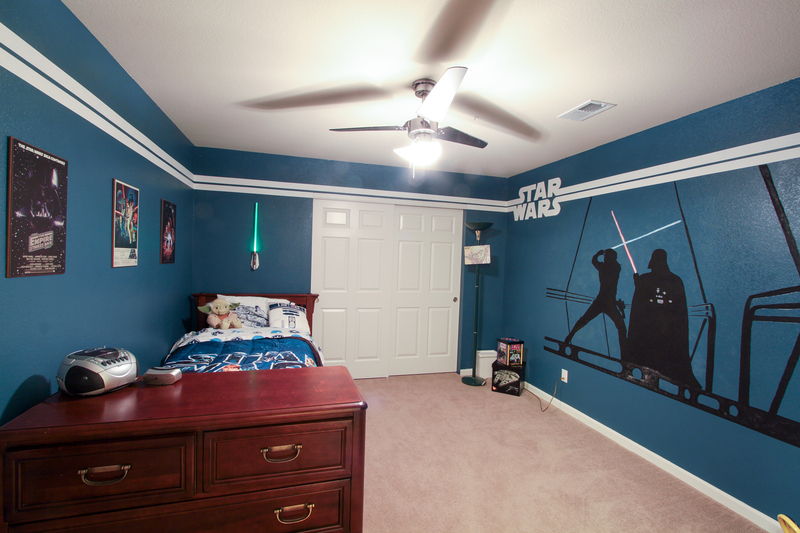 There are lots of ideas out there for Star Wars room, but we wanted something a bit different. We had a lot of fun making this room, so we wanted to share our DIY project and everything we went though in creating it. Everything starts with gathering ideas. 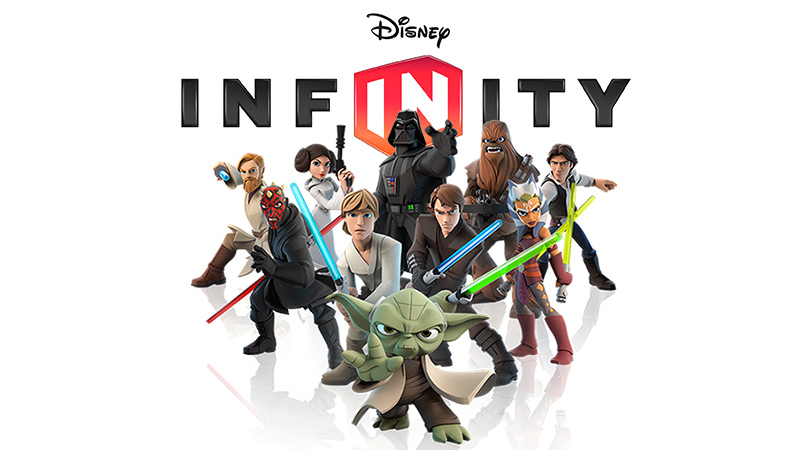 At first, we really wanted to do some huge prints of the new Disney Infinity 3.0 Star Wars characters, but there was no where to get them and printing them ourselves isn’t really possible due to copyright issues and finding quality images that will scale. I really love the style of the new character though, just look at them! 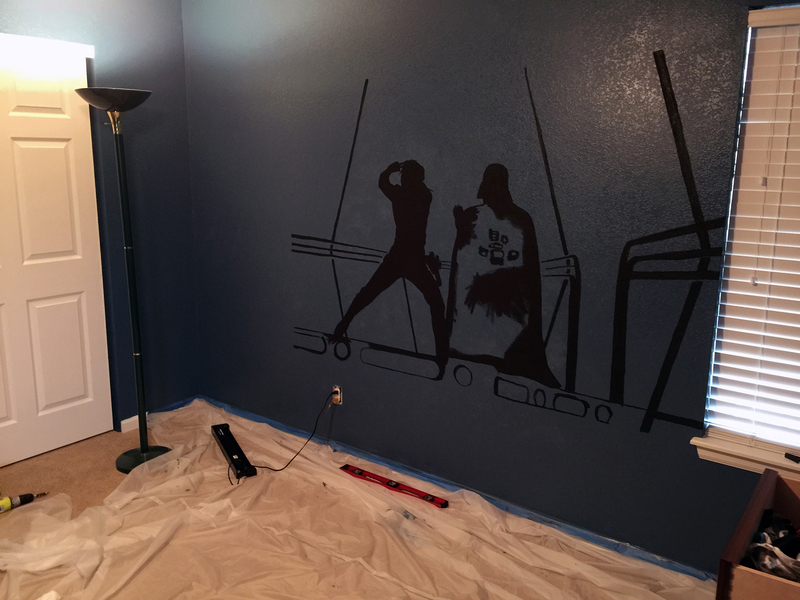 Because of those issues, we started looking at silhouettes of Star Wars characters, and then it hit us. 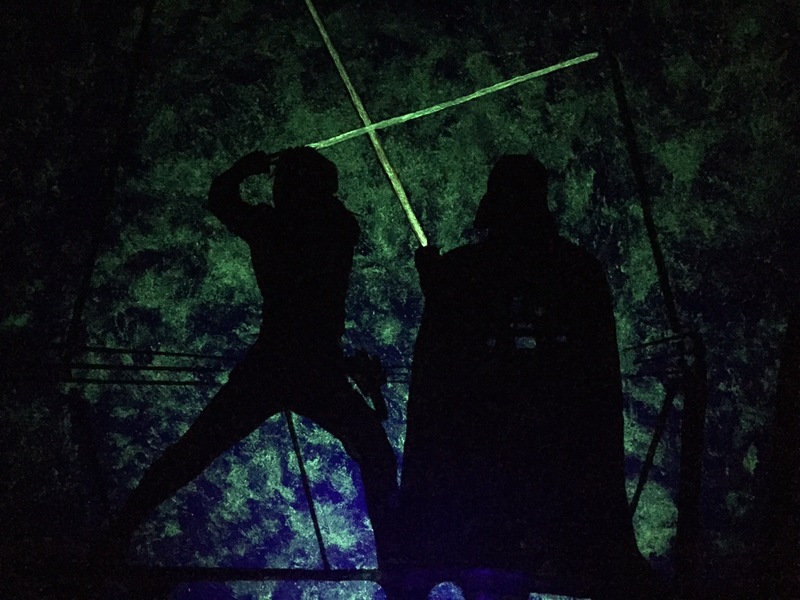 The perfect silhouette scene is the battle between Darth Vader and Luke! This became our focal point of the room, but we still wanted the rest of the room to have some kind of border or accent instead of just a flat color. 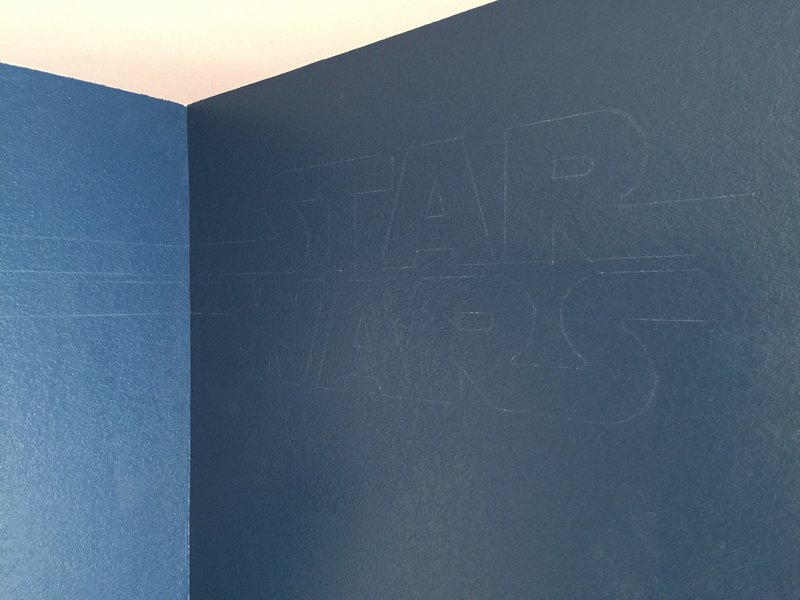 I remembered seeing a design with the Star Wars logo with lines extending out from the letters and thought that would make a great border for the room. 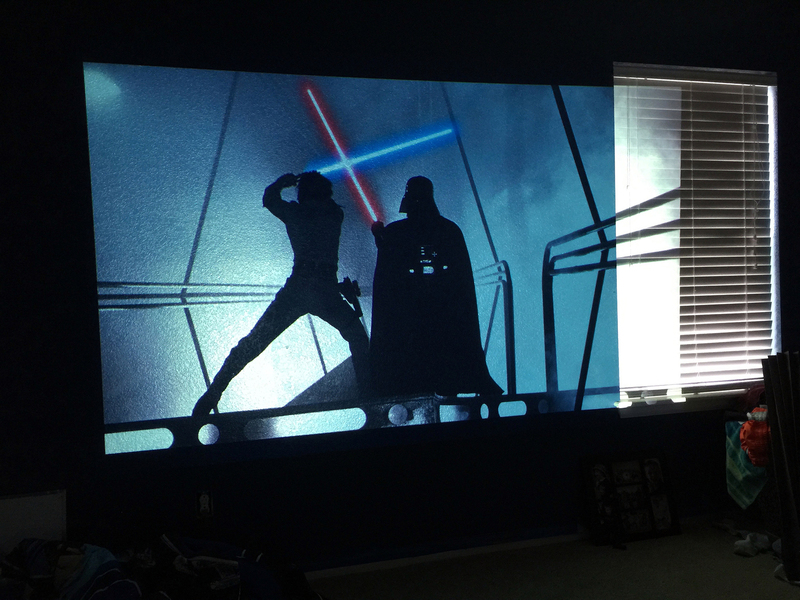 So now that we had a design, we had to figure out how to implement it and create the most epic Star Wars room ever! The mural was the first piece to tackle. We ended up choosing a blue base color (Empire Fleet Blue) who’s name was actually quite fitting. To get the battle scene on the wall, we decided it would be easiest to use a projector to display the image on the wall and we could hand paint the mural. So after setting up the image, making sure the projector wasn’t going to get knocked over, we knew where the mural was going to be placed. The battle between Luke and Darth Vader takes place on a spaceship, they are surrounded by fog and mist. We wanted to try and replicate this fact, but only subtly so, and in a way that you could only see at night. So after we had painted the walls blue, we decided we were going to use some glow in the dark paint so recreate the effect. We used news paper to pat glow in the dark paint all over where the mural would be on the wall. Then after that paint dried, we had were able to start paining the mural. 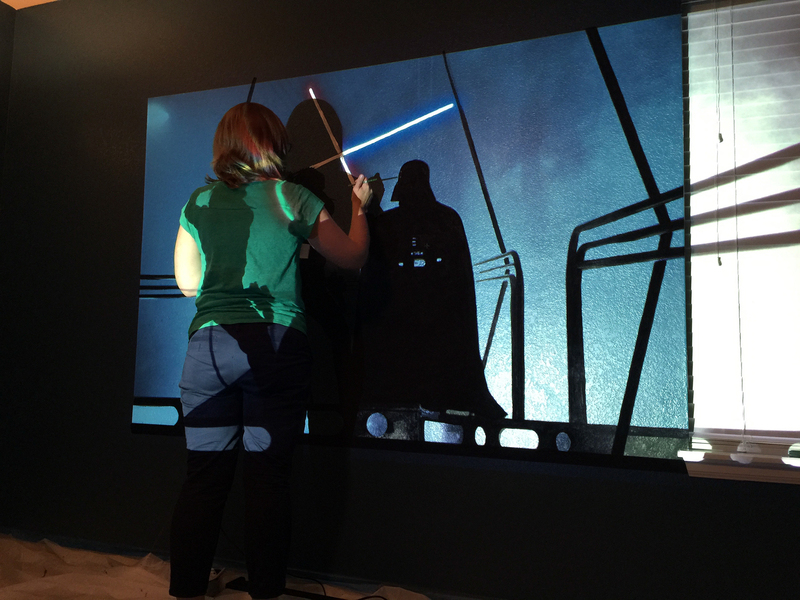 Now we had to start on the Star Wars Logo and the border. 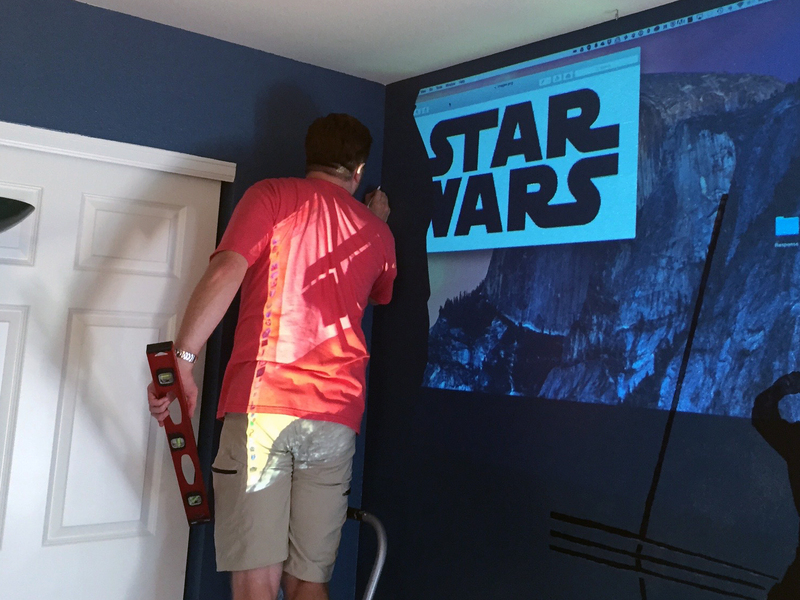 We decided it would be best to first outline the logo, so we used the projector again to put it on the wall while I outlined it with a white colored pencil. We tried to line one of the border lines with the closet that was closest to the logo so it could continue though as the line. Using a level, I continued the lines all the way around the room. Now we had to figure out how to paint them! The logo ended up being hand painted by my wife’s steady hand while I taped off the border lines one at a time. We then painted blue over the tape to hopefully seal the tape to get a clean line. Then we had to wait. It basically took us two days to finish the logo and border because of taping, painting blue, waiting for it to dry, and then painting white over top of the blue. It was worth it in the end, because the border lines came out near perfect. We had to do a little touch up here and there, but for the most part, it turned out great. After we finished the painting, we moved on to the decorations. We saw some great posters mounted on wood at Bed Bath and Beyond for $15/each, so we grabbed a few of those. We also order a lightsaber night light and mounted that above the bed. The bedding came from Khols. 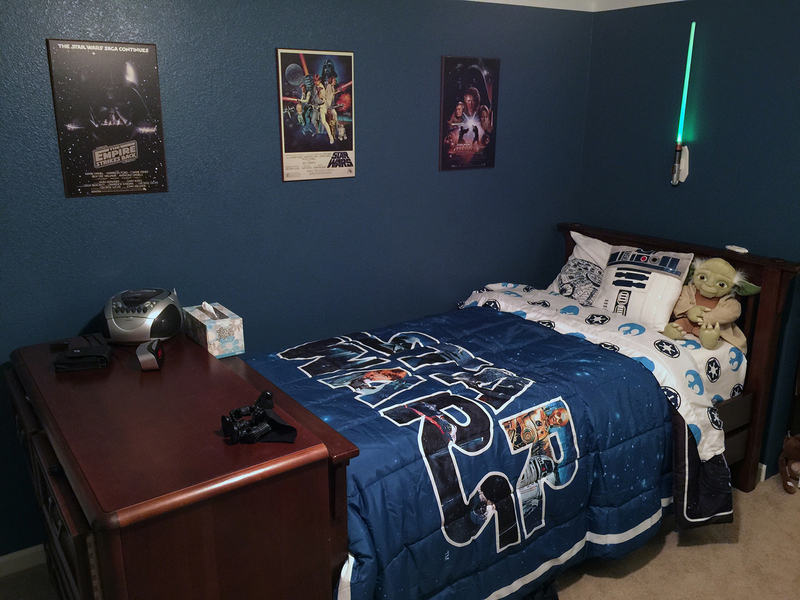 So now we have a mostly complete Star Wars room and we all love it! We still have plans to add shelves to the left of the mural and possibly a desk for him to study at. We are also going to add shadow boxes with Star Wars figures in them on the other wall you can’t see in the photos to finish off the room. We’ll try to update the post with those when they are done. Luckily, a bunch of new toys are coming out in anticipation of Star Wars Episode VII : The Force Awakens. We are all super excited for December when the movie comes out! We hope you all enjoy the room as much as we do!